US, 1951, 87 minutes, Colour. Jean Peters, Louis Jourdan, Debra Paget, Herbert Marshall, Thomas Gomez, James Robertson Justice. Pirate films were very popular after World War Two with Sinbad the Sailor, Treasure Island, Blackbeard the Pirate. This story is based on a true story of a Caribbean pirate, Anne Bonney, in the 18th century. 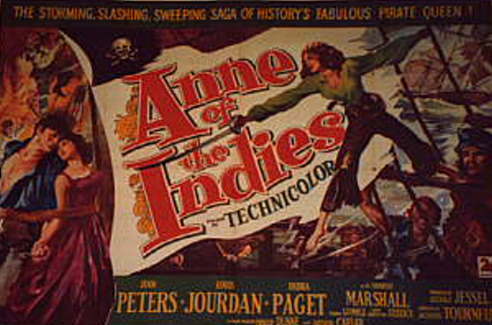 Here she is Captain Anne Providence, played by Jean Peters, a popular star at 20th Century Fox at the time, trained by Blackbeard (Thomas Gomez) and capturing a French captain, Louis Jourdan, who has done a deal to lead her to the authorities. However, she abducts his wife, Debra Paget, and holds them to ransom. James Robertson Justice also appears as Red Dougal, her second-in-command. Herbert Marshall has a very strong role as the alcoholic doctor on the ship. The film looks good, there are battles between the ships, there is life on the ship, life in the ports - though this tends to be of the eye-rolling rollicking type with dialogue like, 'You scurvy scum ...'. The film was directed by Jacques Tourneur who had begun with some horror films for Val Lewton, including Cat People. He directed a number of popular genre films, especially during the 1950s. 1.The perennial popularity of pirate films? The quality of this film? Matinee material? 2.The evocation of the Caribbean, the sea, the islands, the ports? The musical score? 3.The focus on Anne Providence, the story of her background, orphaned, providence in her life, being trained by Blackbeard? Her antagonism towards the English, the execution of her brother? The initial taking of the English ship, making the crew walk the plank? Life on the boat, loyalty of the men, her relying on Red Dougal for advice (and his being placed there by Blackbeard)? Doctor Jamieson and his alcoholism, his protectiveness towards Anne? The confrontation with Pierre, believing him, giving him a job on the boat? Going to port, the treasure map, the encounter with Blackbeard, the joking swordfight with him? Sailing away, the pursuit of the boat, Pierre and his going ashore, seeing his wife? Anne abducting his wife and keeping her prisoner? Pierre's pursuit, the destruction of his ship, her anger, her putting the couple ashore? Blackbeard's pursuit, her change of heart, sending the doctor to go with them to save them? Allowing her ship to be destroyed - self-sacrificing love? 4.Pierre, his background, his ship, its being taken? His agreement to lead the authorities to Anne? Their not believing she was a woman? On board, imprisoned, lashed? On shore, Blackbeard, going to see his wife? Trying to get the captains interested in port? The ship, the pursuit, the capture? The confrontation with Anne? Being put ashore, the final rescue? 5.Molly, loving wife, abducted, the confrontations with Anne, on the island left to die with her husband? 6.Doctor Jamieson, wise, alcoholic, his care for Anne, accompanying her, the final confrontation, her antagonism, sending him on the island to be with the couple? 7.Red Dougal, rough, with Blackbeard, on the boat, loyalty? 9.The perennial popular ingredients of the pirate film?